The Penitentiary of New Mexico (PNM) is located along the old turquoise Trail, 14 miles south of Santa Fe. PNM is the Department's only super-max facility, housing the highest security classification of offenders in the state of New Mexico. 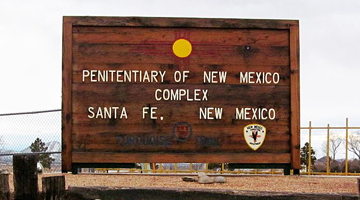 The Penitentiary of New Mexico Complex is comprised of three facilities: Level-II a minimum-restrict unit, Level-IV/V and Level-VI housing the highest security classification of offenders. PNM maintains its national accredited status by the American Correctional Association and continues to intensify its efforts to achieve the mission of the Corrections Department by providing a balanced system approach to corrections from incarceration to community-based supervision with training, education, programs and services that provide opportunities for offenders to transition to communities.